The United States is the most religiously diverse nation in the world, due in large part to the clauses of the First Amendment that guarantee freedom for and from religion. But as we debate displaying Christmas trees at city hall and the Ten Commandments in the courthouse, we must ask: in what other ways is our religious liberty being compromised. 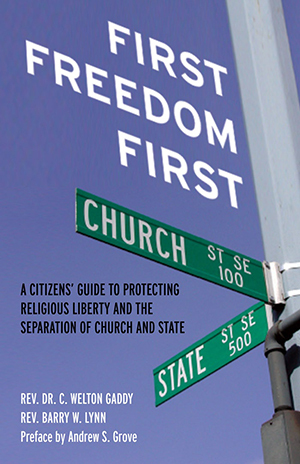 With religion a constant presence in political discussions, First Freedom First offers practical and easy ways to remind our leaders and our community of the importance of keeping religion and politics separate, for the sake of both institutions.